Well, the Eskimos live in the Arctic… but how do you find books and films about them in your library and online? Some librarian has to put the word in the right place for you so that it pops up when you look for it! This is the job of a cataloguer, and it is more difficult when the resources are older, perhaps obscure, not available online, or not even mentioned online. 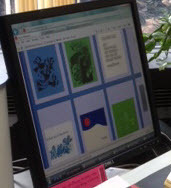 So my colleague, Nazlin Bhimani, designed a LibGuide – and I listed booklets and worksheets, photographs and film cartridges there as well as on the Library Catalogue. But how to describe them in detail? First of all, we needed a reference to the whole scheme in each catalogue entry, so that you find it under ‘MACOS’ as well as ‘Man: A Course of Study’. Next, we inserted one for ‘Jerome S. Bruner’ (and ‘Bruner, Jerome S.’), the man who came up with the concept, although he did not produce all these things himself. Naturally, we also honoured our donor, ‘Mr. Barry D. Varley-Tipton’. Then the contents of the teaching resources… The quest, to which Bruner invited even young children, is: What is human about human beings? The main method is observation and comparison of people and animals in various parts of the world. Well, some items are about ‘Eskimos’ and ‘Tools’ and others about ‘Africa’ and ‘Animals’, but what about ‘Social anthropology’ or ‘Animal behaviour’? Does a certain book focus on science or on social science or both, like this one called, in fact, Salmon? We also decided to allocate ‘Spiral curriculum’ and ‘Interdisciplinary curriculum’ to everything. But how do you get to our information in the first place? Through the Catalogue of the Newsam Library? Through the LibGuides? Through a search engine? (A Google search for ‘macos, bruner’ leads you directly to our Library guides and our Library blog!) And how do we lead you from one point to another efficiently? We have to put the time in so that you can save time later! Finally, we are posting requests for missing items on the LibGuides. For example, we have got a fold-out leaflet for the classroom on Making a bow, and the MACOS Online Archive has digitised a matching one on Building a skin sled: we should swap them and extend our collections online and in the original print! This entry was posted in Cataloguing, Library and Archives, Special Collections and tagged cataloguing, Jerome S. Bruner, LibGuides, MACOS, Man: A Course of Study. Bookmark the permalink.